Alongside the creation of a new opera by Mark Grey at De Munt in June 2016, Q-O2 will, together with De Munt and Bronks, give the opportunity to a group of youths to make their own version and present it during the European Opera Days on May 7th and 8th of 2016. 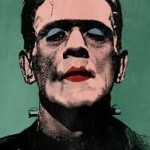 The book by Mary Shelley offers a large palette of aspects and possible interpretations which will speak to youths: the artificial human like often thematised in science fiction, the difficulty to discover one’s personality and unify it to the appearance, but also questions about gender and different models of family and consequently of society. A team of coaches – Carly Wijs (scenography), Audrey Lauro (music), Roman Vanhoutven (dance), Kadanja (decor) and Kaat De Windt (composition), reinforced by some of the residents of Q-O2 – work with two classes of 4th secondary professional schools who develop their own material. It is an encounter between a Dutch- and a French-speaking school: Regina Pacisinstituut in Laeken en Athénée Royal d’Ixelles.